Salmon canneries such as the one at Funter Bay were required to file annual reports to the government, detailing statistical information on their catches, employees, and financial situation. These are recorded in the National Archives Record Group 22, Records of the US Fish and Wildlife Service (Formerly the US Fisheries Bureau). A number these records can be downloaded from the NOAA document library, although they are not clearly indexed. I was able to find the annual reports for 12 of the 29 years (1902-1931) that the Funter Bay Cannery was actively working. The original PDF files can be downloaded at the bottom of this post. Some of the information in the reports seems to contradict other sources in regards to the size and number of boats, demographics of workers, etc. I am not sure which sources are the most reliable, but the official nature and later requirement for notarized reports suggest some degree of accuracy with these. That does not necessarily mean they are *complete*, as there are plenty of hints elsewhere of “creative” legal loopholes. For example, boats described elsewhere but not listed here may have been owned privately by company executives rather than the company itself. It is also not clear if wages were calculated before or after any deductions for room & board, company store, etc. In 1904 the Funter cannery was valued at $150,000 and had $80,000 in stock. It paid $27,000 in wages to 75 plant employees, including 25 White, 20 Native Alaskan, 30 Chinese, and 20 Japanese workers. In addition, 28 Fishermen were employed, including 17 Whites and 3 Natives. There was one 82 ton steam vessel worth $17,000 with a crew of 5, 8 skiffs, 3 lighters, 3 scows, and 2 pile drivers, together worth $12,500. The cannery handled mostly Red (210,000) and Pink (330,000) salmon, with smaller numbers of Silver (48,000), Dog (6,500), and Kings (800). Market value of the catch for 1904 through Ocbober was $147,463. All traps were in Icy Strait, Chatham Strait, or Lynn Canal. In 1906 the value of the plant had increased to $300,000, and wages to $51,000. The number of fishermen dropped to 20 White men, while Cannery workers increased to 12 White, 35 Native, 44 Chinese, and 18 Japanese. An additional steamer was added but was not in regular use. One pile driver, 3 skiffs, and all 3 lighters vanished from the roster, the small boats were replaced by (or perhaps reclassified as) dories. Two more scows were added. In 1906 the cannery handled 600,000 Pink salmon, 220,000 Reds, 110,000 Dogs, 42,000 Silvers, and 900 Kings, worth $214,719. In 1910 the reporting form changed slightly. The cannery was reportedly worth $500,000 and had 3 resident superintendents and 20 salaried clerks and employees. Wages for salaried employees were $18,600, cannery workers $47,800, fishermen $25,000 and transporters $3,600. The total work force included 51 White, 106 Native, 77 Chinese, and 38 Japanese. The cannery had 2 steamers, 15 rowboats, 10 lighters and scows, and had added back one pile driver for a total of two. Eight fish traps were reported. The sailing vessel General Fairchild is mentioned as being owned, but not used. Production is listed this year in terms of cases, with 9,610 cases of Coho (Silver), 16,668 of Dog (Chum), 40,805 of Pink (Humpback), and 31,583 of Red (Sockeye). Reds were in two can sizes. In addition, pickled or salted fish are reported in this year, including 2 barrels of whole King salmon and 11 barrels of King bellies. Total value appears to have been $392,081.80 (from 1910 to 1915 the totals are not given explicitly, and the income sheet seems to have been used as a scratch pad). This year also introduced the notary requirement, with company secretary M.G, Munley acting as notary for owner James T Barron. In 1911 there were 61 White, 90 Native, 75 Chinese, and 48 Japanese employees. The company now had 25 rowboats and 11 lighters and scows. There were 12 stationary fish traps. 10,946 cases of Coho, 20,224 of Dog, 43,844 of Pink, 341 of King, and 23,928 of Red salmon were produced, apparently worth $415,477.06. No pickled fish were reported this year. Manager Fred Barker signed off on the 1911 report instead of Barron. 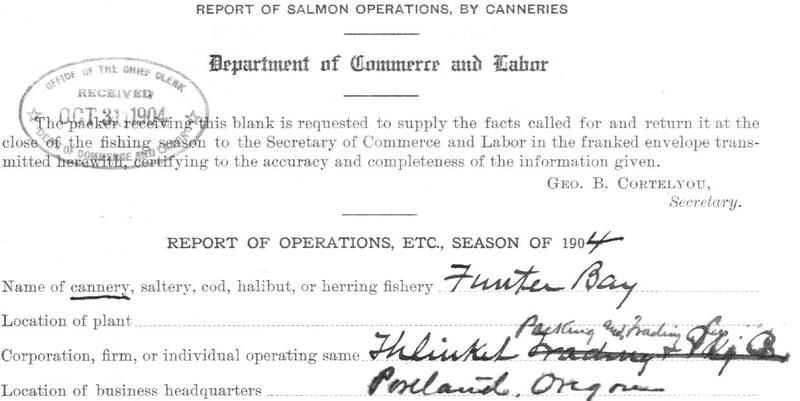 The 1912 report deals mostly with the type of salmon caught, and does not contain income, equipment, or employee data (one or more pages may be missing). 750 Kings were caught in Icy Straight between Excursion Inlet and Point Couverden (the Homeshore stretch). 187 Kings were caught in Chatham between Funter Bay and Point Retreat. All Kings were caught between June 10 and July 10. A total of 351,309 Reds were caught between June 12 and Sept 1. 508,050 Pinks were caught between June 20 and Aug 20. 69,853 Coho between July 15 and Sept 12, and 354 Dog salmon between June 12 and Sept 12. Most of the fish of each species were caught in the traps at Homeshore. The 1913 report goes back to detailing workers and boats. This year saw 79 White, 48 Native, 44 Chinese, and 44 Japanese employees at the cannery. There were 13 stationary traps and 3 pile drivers. One skiff had disappeared since 1911. 6,164 cases of Coho, 19,766 of Dog, 60,230 of Pink, 220 of King, and 25,494 of Red salmon were packed. No salt/pickled fish were reported. Total value seems to have been around $413,192. A detailed report similar to the 1912 data is appended showing how many fish were caught where on which dates. The 1915 report changed format again, now reporting vessel names (Gas launch Buster and Steamer Anna Barron were the two large boats, there was also an unnamed gas launch). 17 staked traps were listed. Employees included 62 White, 51 Native, 75 Chinese, 30 Japanese, 4 Filipino, 1 Korean, and 4 Mexican (earlier reports did not have so many categories, and could have lumped Filipino and Korean workers into another category). Sockeye were packed in three different can sizes, for a total of 22,231 cases, King production was 339 cases, Coho 4,996, Pink 48,450, and Chum 16,873. Total value was $311,547.64. 1916 saw 107 White, 63 Native, 64 Chinese, 38 Japanese, and 4 Filipino workers, with total wages paid of $100,000. 23 staked traps are listed. The pack included 134 cases of Kings, 15,560 of Red, 15,028 of Coho, 65,809 of Pink, and 25,292 of Chum worth $495,015.80. A note stated that the cannery did not count individual fish, but estimated catch numbers based on cases packed and average weights. superintendent H.W. Chutte signed off on the 1916 report. 1918 saw 93 White, 50 Native, 46 Chinese, 44 Japanese, 14 Filipino, and 3 Mexican employees, paid a total of $129,500. The gas boat Barron F was added to the roster. The number and type of traps stayed the same. More species were packed in different can sizes, including 1/2 lb “48s”, 1lb flat cans, and 1lb tall cans. 6,570 cases of Coho were packed, 41,590 of Pink, 28,732 of Chum, 577 of King, and 26,274 of Red, worth $568,438.46. James Barron went back to signing off on the reports. 1920 saw a change in name from Thlinket Packing Company to Corporation. The fishing method also started to shift drastically towards floating traps (12 reported) and away from staked traps (9 reported). Buildings were valued at $257,500 and trap sites at $400,000. Workforce included 94 White, 22 Native, 40 Chinese, 44 Japanese, and 7 Filipino, and wages were $115,500. One floating trap worth $1,200 was reported lost. 5,126 cases of Coho, 12,663 of Chum, 17,971 of Pink, 167 of King, and 15,445 of Red were packed, for $262,916.23. After 1920’s drastic decrease in sales, 1921 saw a smaller workforce of 52 White, 65 Native, 24 Chinese, 15 Japanese, and 8 Filipino, paid a total of $63,152.42. The Steamer Anna Barron was reportedly taken out of state. The company by now had 31 rowboats and 16 scows. 1 pile driver is listed. Only 5 staked traps and 6 floating traps are listed, along with 1 rented trap and 6 trap frames which were hauled out on the beach and not in use. Production ceased on the smaller cans (except for Reds), total pack was 8,250 cases of Coho, 10,114 of Chum, 13,820 of Pink, 126 of King, and 9,916 of Red, worth $187,095. Sales Manager C.F. Whitney signed off on this year’s report. 1922’s report had 68 White, 42 Native, 23 Chinese, and 25 Filipino employees, paid $51,020. 4 staked traps and 6 floating traps were used, 3 trap sites were leased from another company. 2 Floating traps were reported washed away, for a loss of $8,400. The smaller cans made a reappearance and were especially popular for Sockeye, with a total production of 4,901 Coho cases, 4,017 Chum, 17.023 Pink, 30 King, and 11,755 Red. Value was $103,025. These falling numbers may have led to the property’s 1926 sale to Sunny Point Packing. The marked decline of the salmon runs after 1920 was due to overfishing and the ongoing proliferation of fish traps (which peaked around that year). After 1920 there were many new regulations and attempts at protecting the fish stocks, but by 1953 Alaska’s salmon industry was declared a major disaster by the Federal government. Fish traps were outlawed after statehood in 1959, and modern boat-based fisheries are more tightly managed and regulated. This entry was posted on Saturday, August 8th, 2015 at 11:35 am and is filed under Alaska History, Funter Bay History. You can follow any responses to this entry through the RSS 2.0 feed. You can leave a response, or trackback from your own site.